Exquisite Manhattan pied-a-terre or residential apartment -- superlative in every respect: mint condition, total tranquility and suffused with all-day sun, duplex (floors eight and nine), Manhattan's most 'desirable location,' (Fifth Avenue @ 68th Street) and SWEEPING PANORAMIC VIEWS OF ENTIRE PARK FROM EVERY ROOM!Renovated and decorated by a renowned Italian decorator, the apartment features, on the first level, a gracious entry foyer with a perfectly situated powder room/half bath, oversize living room with large bowed windows directly on the park, windowed kitchen on the park.An elegant and dramatic winding staircase leads gracefully to the second level with a spacious master bedroom with direct park views, abundant and commodious closets, en suite master bath with tub and shower. 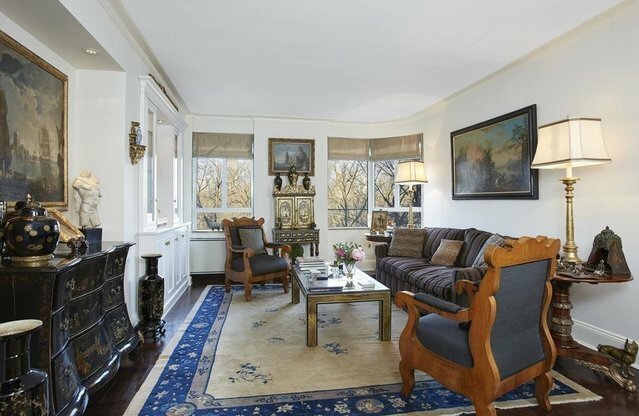 Upper level of duplex can be accessed directly from ninth floor.870 Fifth Avenue is one of very few luxury Fifth Avenue co-ops having a limited number of smaller apartments with direct Fifth Avenue/Central Park views. Building amenities include large private storage locker, state-of-art exercise room, private roof deck/terrace with 'spectacular views in all directions' (perfect for relaxing or entertaining), private planted garden off the lobby, manned elevators, valet, bicycle room, meeting room, video security, central laundry and valet laundry service. Pied-a-terre ownership allowed! The building is pet friendly!